A walled town in New Castile, Spain, situated on the right bank of the Henares, about seventeen miles from Madrid; birthplace of Cervantes (1547). In the Middle Ages its Jewish community was under the jurisdiction of the archbishop of Toledo, who exercised the right to nominate its rabbis and appropriated part of the taxes that the Jews were obliged to contribute, which, in 1291, amounted to 6,800 maravedis (about $23,000) in gold. The Ordinance of Alcalá, issued, in 1348, by Alfonso XI. of Castile, is well known for its important influence on Spanish-Jewish history. The community of Alcalá possessed several synagogues; the largest stood on the Calle de la Xinoga ("Synagogue Street"), in which, as well as in the Calle Mayor ("High Street"), the Jews had their dwellings. In the courtyard of a large house in the Calle Mayor was a small synagogue; and between the Calle Mayor and the Calle de Santiago the Jewish slaughter-house was situated. Menahem b. Zerah lived here as rabbi from 1361-68. 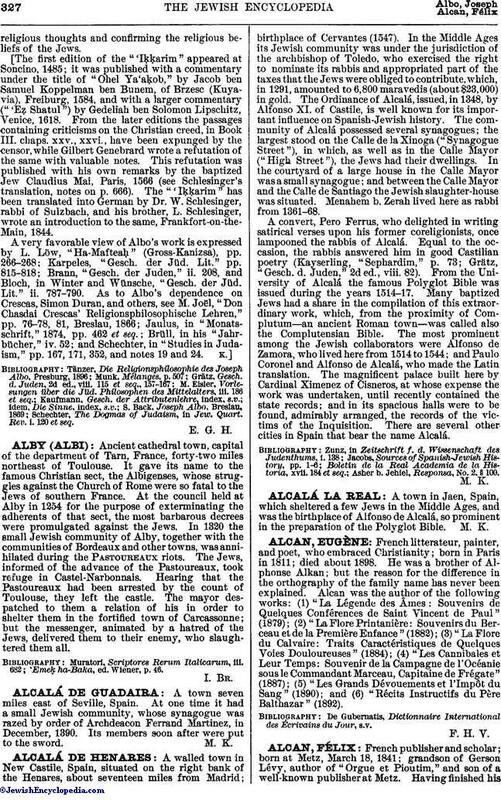 A convert, Pero Ferrus, who delighted in writing satirical verses upon his former coreligionists, once lampooned the rabbis of Alcalá. Equal to the occasion, the rabbis answered him in good Castilian poetry (Kayserling, "Sephardim," p. 73; Grätz, "Gesch. d. Juden," 2d ed., viii. 82). From the University of Alcalá the famous Polyglot Bible was issued during the years 1514-17. Many baptized Jews had a share in the compilation of this extraordinary work, which, from the proximity of Complutum—an ancient Roman town—was called also the Complutensian Bible. The most prominent among the Jewish collaborators were Alfonso de Zamora, who lived here from 1514 to 1544; and Paulo Coronel and Alfonso de Alcalá, who made the Latin translation. The magnificent palace built here by Cardinal Ximenez of Cisneros, at whose expense the work was undertaken, until recently contained the state records; and in its spacious halls were to be found, admirably arranged, the records of the victims of the Inquisition. There are several other cities in Spain that bear the name Alcalá. Asher b. Jehiel, Responsa, No. 2. § 100.